If you've read any of my previous reviews, you're aware of my feelings on Batman. So when a DC Direct line of figures based on Alex Ross's art was announced, my first question was "Where's Bruce?" My query was answered when Series 2 was unveiled and Bats was the headliner. Now that Series 2 has hit comic and specialty stores, I've finally got my hands on this bad boy. This isn't the first Batman figure designed by Alex Ross. Heck, if you want to be technical, it's not even the second. Before this, there was the Kingdom Come Batman based on Mark Waid's tale of the DC Universe's future, and before that there was a 9" "doll" designed by Ross based on Batman's first appearance (I believe this came packaged with a book of some sort). 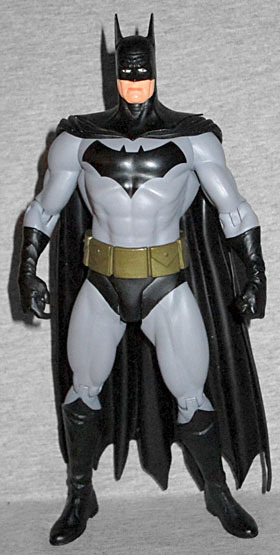 This is, however, the first Alex Ross Batman figure in the modern day, canonical outfit that we all know and love. DC Direct's Kingdom Come Bats sports a Darth Vader-esque flight suit that allows frail old Bruce Wayne to go toe to toe with Earth's slower-aging superheroes, whereas the first appearance doll... well, the purple mittens speak for themselves. This Batman, based on Ross's art from the new Super Friends-inspired title, Justice, is the Ross Batman we've all been waiting for. Not everyone digs Ross's style. He paints his pages using guache, and many criticize that his ultra-realistic depictions of superheroes look geriatric. However, whether you love it or hate it, you can't knock Tim Bruckner for his perfect three-dimensional translation of Ross's vision of the Dark Knight. Bats looks like he stepped right off the pages of War on Crime, the oversized book written by Paul Dini. In true Ross fashion, the muscles are more suggested than exaggerated, the leather of the gloves and boots is appropriately crinkled, and the utility belt is painfully oversimplified. As with the Superman figure from the first series of Justice figures, Batman's cape hangs realistically limp, bucking the typical action figure trends of the flared cape, the windblown cape, or (ugh) the cloth cape. The headsculpt is really great, with a nice furrowed brow and the slightly smug face you expect Batman to have. One more thing to note about this figure's sculpt: as with most DCD figures, scale is an issue. At 7⅜" tall, Bats towers over every other Batman figure I own, other than my 1:6-scale Batmen. Hell, he towers over pretty much every DCD figure I own, including my Alex Ross Superman. That might bother some, but after "Hush" Batman clearly outbulked "Hush" Superman, I've learned to live with such discrepencies. The paint is pretty good, but be sure to inspect your Batmen before you buy. A few on the pegs had some paint that rubbed off onto the plastic bubble of the box, and some of the eyes look a little wonky. Speaking of eyes, since the figure is done in a more realistic style than most, Batman's eyes show through his mask, pupils and all. With the exception of movies and live action television shows, Batman usually has some kind of white lenses covering his eyes. But Ross's style allows the eyes to show through, and they look pretty nice. However, for some reason Ross insists that Bruce Wayne has brown eyes, when I'm almost certain most sources would say he's got baby blues. His chest emblem is painted, not sculpted, and it's nice and large with no bleed. His face where the exposed flesh meets the cowl is a little messier than we'd like, but it's not overly distracting. With the recent strides DC Direct has been making in articulating its figures, it's disappointing to see such routine work on Batman. His neck has a peg joint, not a balljoint (like we got on the "Hush" Batman), and while his shoulders are balljointed, the range of movement is fairly limited. He's got elbow hinges, but he doesn't have a peg joint at the glove tops (like we got with the "Public Enemies" Batman). Other than that, we get a t-crotch and hinged knees. No wrists, no waist, and no ankles. Also, the ratchets that were present on the hinge joints of the "Public Enemies" figures are unfortunately not here, so loose knees may be a problem in the future, much like the Justice Superman figure. All in all, a big step backward from the improvements DCD has been making recently in the articulation department. In my review of the "Public Enemies" Batman, I stated there's no excuse for a Batman figure to lack the one essential accessory Batman is never without: a batarang. Thankfully, this Batman gets it right. Not only does he come with a batarang, it's the best damn batarang we've ever seen. Despite the fact that it's only about a millimeter thick and about an inch and a half in length, the batarang features a hinge that allows it to fold in half. It's a marvellous accessory, though it does seem a tad delicate, particularly on the points of the wings. With a little work, the batarang can be secured in Batman's slightly opened right hand. 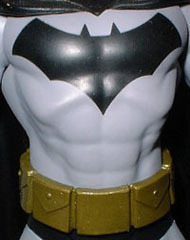 Not only that, but the batarang, when folded, can fit into an oversized pouch in the back of the figure's utility belt! Nice touch. Like the rest of the figures in this line, Batman comes with an extravagant base painted to look like stone bordered by brushed aluminum. It's nice to have a base, particularly with a high probability of knee wilting in the near future, but these bases are a little too decadent for my taste, and they take up a lot more shelf space than most bases. This is a darn good Batman figure. While the articulation is lacking, the sculpt makes this well worth the purchase. Now that Bats is in my possession I'm even more excited for Series 3 of the Justice line, which will feature Alex Ross versions of bat-villains the Joker (possibly the best-looking Joker figure ever) and Poison Ivy (wearing nothing but tattered vines and a smile). Can't wait!